Defrost pie dough as indicated in package instructions.Preheat oven to 400 degrees F.
Roll out dough to about 1/4 inch thickness. Line 5-inch tart shells (with removable bottoms) with dough. Gather excess dough and pat together. Roll out to 1/4-inch thickness. Using a small leaf cookie cutter (or desired shapes) cut out decorative pieces to lay on top of tart. Set aside.In a medium bowl, toss together sliced apples, sugar, cinnamon, salt, and lemon juice. Adjust with additional sugar or cinnamon, according to taste. The mixture will get sweeter after baking. Cover mixture with plastic wrap and let sit for 5-10 minutes to allow apple to expel a little moisture.Arrange apple slices on prepared tart shells. Add decorative pie dough cut-outs on top. Sprinkle turbinado sugar as desired. Bake for 30-40 minutes until crust is golden brown and cooked through. To check for doneness, lift crust and check if bottom is golden brown. Let cool slightly before serving.If desired, drizzle with caramel, add a scoop of ice cream, or add a dollop of whipped cream. 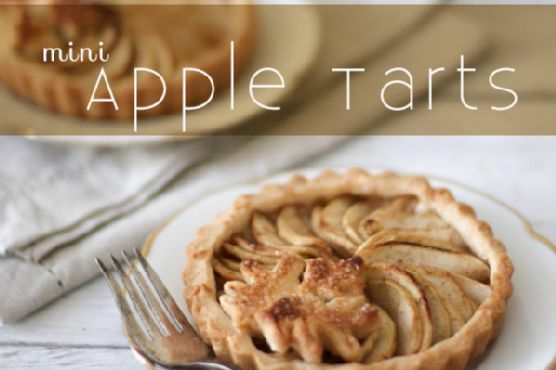 Apple tart can be served warm, at room temperature, or chilled.